Palm Beach State College Associate Professor Kanathy Haney has landed a spot in the second “40 Under 40” class of the American Association for Women in Community Colleges for her efforts to raise awareness of human trafficking and to help victims. Professor Kanathy Haney, center, is congratulated by PBSC President Ava L. Parker, J.D., and Dr. Roger Yohe, vice president for academic affairs. Haney was recognized April 23 at the AAWCC’s Awards Breakfast held during its annual national conference in New Orleans. Not only is she on the “40 Under 40” list, she ranks first and was asked to speak at the awards breakfast that recognizes faculty, administrators and staff nationwide for their creativity, innovation and leadership on campus and in the community. AAWCC is the largest affiliated council of the American Association of Community Colleges. Dr. Roger Yohe, vice president for academic affairs, and President Ava L. Parker, J.D. joined her at the awards breakfast, which Haney says was an additional honor. 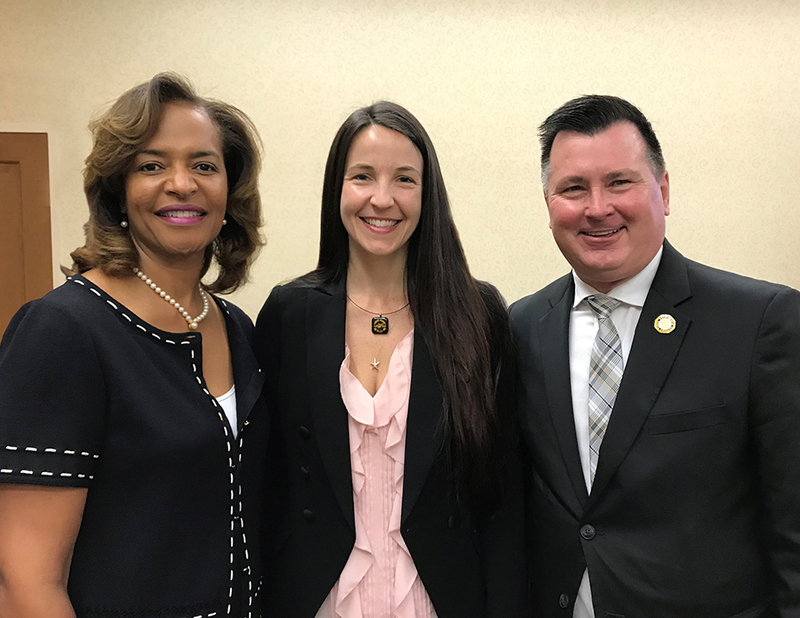 “We are proud that Professor Haney earned the distinction of being at the top of her class of “40 Under 40.” Her keynote address was an inspirational message to all of us who face the current challenges of our work in higher education,’’ Yohe said. The 40 Under 40 Award is the latest in a string that Haney has received. She received a 2016 PBSC Bravo Award, and a 2017 PBSC Martin Luther King, Jr. Leadership Award. She also is a 2017 recipient of the National Institute for Staff and Organizational Development Excellence in Teaching and Leadership Award that will be presented this summer. A professor of health sciences on the Lake Worth campus, she began working at the College initially as an adjunct instructor in January 2014 and was hired full time later that year. Like many new professors, she quickly became involved on campus, finding her place to make a difference. At the recommendation of Professor Peggy Holmes-DeGraw, who has since retired, Haney took on the role in 2015 as chair of the Lake Worth campus Human Trafficking Coalition. It was a natural fit, given that she had already been serving as a volunteer with Rescue Upstream, the anti-human tracking initiative of Journey Church. She also is a member of the Human Trafficking Coalition of the Palm Beaches. In her undergraduate school days at Florida Atlantic University, she interned at the Department of Children and Families, and early in her career she worked as a social worker, all experiences that she brought into her role as chair of the committee. Haney was nominated for the honor by Professor Suzanne Duff, who was named to AAWCC’s inaugural 40 Under 40 class last year. She holds a Bachelor of Social Work degree, a Child Welfare Certificate, and a Master of Science degree in Exercise Science and Health Promotion from Florida Atlantic University. She is currently completing a Doctor of Philosophy degree in Public Health at the University of Florida. She is an amazing woman, and I’m proud to say that I know her and have worked with her in the Wellness Committee. She is a doer and deserves all the recognition she’s been getting. Congratulations, Kanathy! Kudos to Kanathy! She is an extraordinary woman doing remarkable things that improve the lives of others. Congratulations! Hearty Congratulations, will inspire more to do more than a job! Kanathy–thank you for your work on behalf of these victims. This is so very important and I am glad to know someone such as yourself is so involved. Kanathy, once again I am so proud of you and the work you are doing. Congratulations on this award! You are very deserving. What you have already accomplished at 31 is beyond impressive. What a wonderful role model you are! I was blessed to be your teacher.